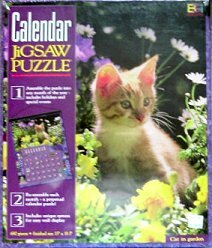 This attractive yet practical jigsaw puzzle is also a perpetual calendar. The manufacturer has included a system for wall display. Special events and holiday symbols included. The puzzle contains 680 pieces and when assembled is 15" x 19.5".